310-SIGN makes ordering the right signs easy! Choose from our most popular selection of top sellers. If you'd like to talk to an expert, we'd be happy to help! 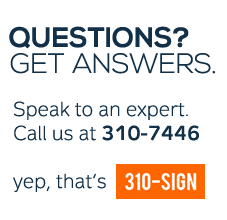 Give us a call toll free at 1-844-BUY-SIGNS, that's 1-844-289-7446. You can also Buy Popular Safety Signs Online securely using a credit card or take advantage of our net-30 terms by registering for Express Checkout! This post pounder is designed to work with Light Duty Sign Posts (1.12lb/foot), Telespar (Squ..